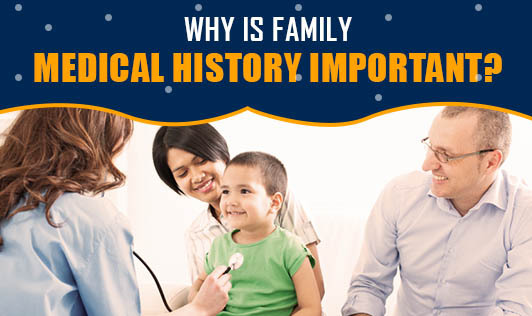 Why Is Family Medical History Important? Most of us are aware of our family medical history. But do we know what role it plays in our health? Normally, families have many things in common. Not only do they share their genes but also the lifestyle and the environment. When put together, these factors can give the health professionals an idea of what or why a person suffers from a health problem. Sometimes, these factors can also indicate if the future generations may be at an increased risk of a particular disease. By knowing the family history, it's easier to find out the risks for common lifestyle problems like heart disease, high blood pressure, stroke, osteoporosis, diabetes, cancer, etc. Information on rare conditions like cystic fibrosis can also be obtained through family medical history. Although the immediate family (parents and siblings) are considered as most influential while taking family history, sometimes grandparents, uncles, aunts and cousins might also be considered. So, make sure you are aware of your family medical history. This can help to reduce your risk of developing diseases, if proper precautions are taken.